We present a protocol for building, validating, and simulating models of signal transduction networks. These networks are challenging modeling targets due to the combinatorial complexity and sparse data, which have made it a major challenge even to formalize the current knowledge. 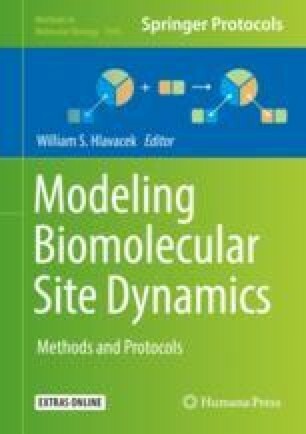 To address this, the community has developed methods to model biomolecular reaction networks based on site dynamics. The strength of this approach is that reactions and states can be defined at variable resolution, which makes it possible to adapt the model resolution to the empirical data. This improves both scalability and accuracy, making it possible to formalize large models of signal transduction networks. Here, we present a method to build and validate large models of signal transduction networks. The workflow is based on rxncon, the reaction-contingency language. In a five-step process, we create a mechanistic network model, convert it into an executable Boolean model, use the Boolean model to evaluate and improve the network, and finally export the rxncon model into a rule-based format. We provide an introduction to the rxncon language and an annotated, step-by-step protocol for the workflow. Finally, we create a small model of the insulin signaling pathway to illustrate the protocol, together with some of the challenges—and some of their solutions—in modeling signal transduction. Jesper Romers and Sebastian Thieme contributed equally to this work. The online version of this chapter ( https://doi.org/10.1007/978-1-4939-9102-0_4) contains supplementary material, which is available to authorized users. This work was supported by the German Federal Ministry of Education and Research via e:Bio Cellemental (FKZ0316193, to MK).